A cloud-based automated reminder system hosted in Canada. TUCSON, AZ — Inphonite, LLC recently released InphoniteVoice SaaS Canada. President, Christine Tosi had this to say, “We know there are concerns about the use of cloud systems and the storage of private information on servers in other countries, especially in British Columbia and Nova Scotia. IV SaaS Canada bridges this gap without crossing borders. IV SaaS Canada is fully PIPA and PHIPA compliant. Personally Identifiable Information (PII) and personal health information never cross national borders. This includes all data: in transit, at rest, and backups.” InphoniteVoice Canada uses the same technology as our battle-tested USA solution. 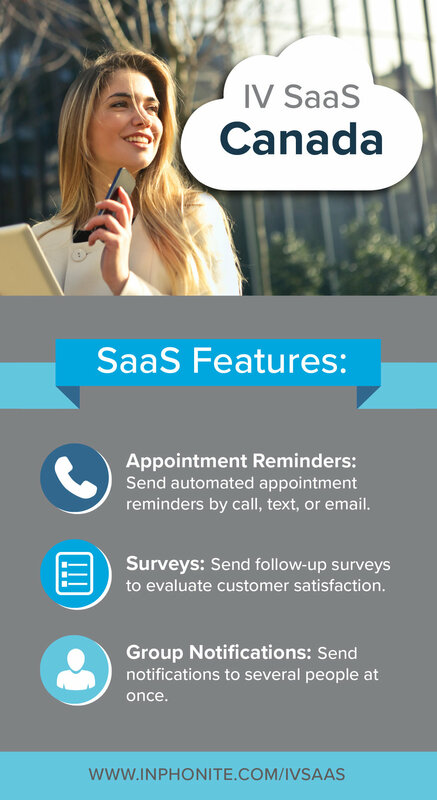 InphoniteVoice SaaS Canada is a cost-effective, fully customizable automated messaging system that offers several functions including healthcare and other appointment reminders, past due notices, surveys, and more. It can integrate with virtually any scheduling software to send voice, text, and email reminders and messages. Part of the benefit of IV SaaS Canada is that it requires no additional hardware to install and it can be easily accessed from any PC. Inphonite has been providing patient engagement software and services for over 20 years. Our Company believes in creating infinite relationships with each of our customers by providing excellent personalized support; and, for all of their customers and patients by developing professional, interactive, cost-effective computer and telephony services that improve the profitability and productivity for any business. Inphonite products integrate with Electronic Medical Records (EMRs) and most databases to enhance doctor/patient or business/customer relations by easily and effectively delivering customizable and affordable communication tools. Inphonite sends millions of messages around the world each day and is the solution provider of choice for healthcare organizations, businesses, educational institutions, and government agencies. For more information on Inphonite, visit the company website: www.inphonite.com call: (520) 797-1844, (800) 350-7693 or email: sales@inphonite.com.